A functional pair of rain boots or some old plastic flip-flops might seem good enough for a day spent working in your garden, but you’re risking way more than the occasional blister and sore heels at the end of the day. The right gardening shoes not only keep all the nasties nature has to offer away from your feet, but also provide the proper grip to keep you from skidding off over damp earth or wet grass, offer the perfect fit to support the inherent shape of your feet without leading to improper posture, and keep your toes safe from any bug bites or careless accidents with your gardening tools. So which shoes should you be investing in to make the gardening business that much easier? Here are our top picks. 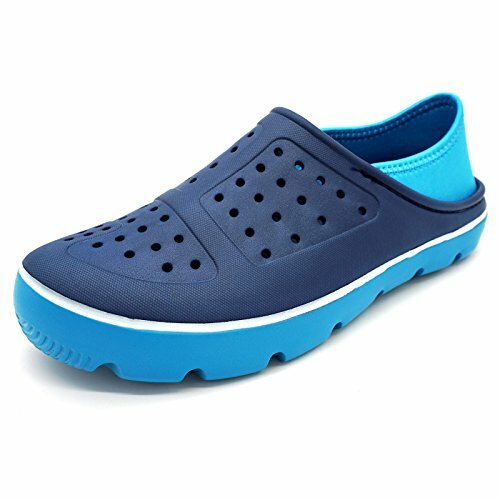 These shoes are beloved not only by gardening enthusiasts but also nurses, dog trainers and other professionals for how great they are to keep on for long hours, without risking aggravating any heel pains or improper posture problems. Lined with an all-day-comfort insole which hugs the curves of your feet and supports their natural shape and arch, you can spend hours at a time trudging through your garden without having to go back indoors with sore, aching feet. The trademark deep lug tread of the shoes gives you greater stability and grip, letting you firmly move through mud or wet grass without risking slipping or sliding off, while the simple but effective design is perfect to quickly toe into and out of without the added hassle of lacing or buckling your footwear. Structured out of 100% recyclable material, these shoes are water-resistant and incredibly simple to hose or wipe down after a day spent stomping around in the mud. And as if these weren’t already hitting every checkpoint in our list of requirements for the perfect gardening shoes, they also happen to come in a range of over 20 charming colors and patterns, which may or may not make you loathe to take them off. If you’re looking for something a little on the cheaper side, not as heavy-duty, and/or just functional enough to hop in and out of as you putter around your garden, these shoes are both literally and figuratively the perfect fit. Available in 16 bright and vibrant colors and patterns, the synthetic design of the shoes come with ergonomic rubber insoles to keep your feet comfy as you de-weed your garden or mow your lawn. Decked out with ventilation ports, these shoes are more breathable and perfect to have on during the sweltering afternoons of summer, as long as you don’t mind the risk of getting a little water or dirt into your shoes. Never fear, though – these pairs are totally water-resistant, and can easily be hosed down in a jiffy. With a laceless design that lets you slip them on with ease and a buckle at the back of your heel to secure them in place, this simple but classic design is thoroughly ideal for days spent out gardening. 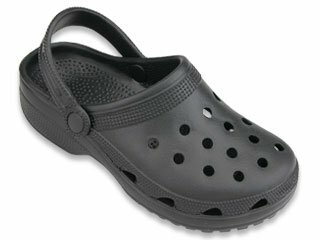 With a minimalistic but attractive and contemporary design, these shoes breathe both comfort and style. 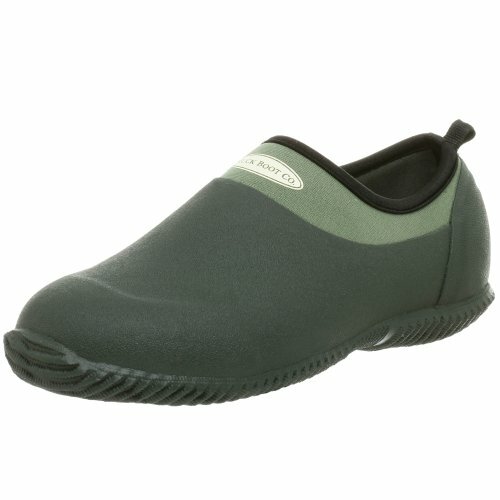 Constructed out of EVA, a soft, elastic but highly durable and wear-resistant polymer, these shoes are structured with a slip resistant outsole and extra tread to keep you steady and firm as you work your way around your yard or lawn without the fear of slipping in a patch of wet grass. Available in 4 tasteful color combinations that make these perfect to throw on if you’re going out to the pool, waterpark or simply a jog down the street, these snug shoes are designed with ventilation ports just big enough for them to be breathable, but secure enough to keep any pebbles or dirt getting into your shoes. Built to last, they come with a pull tab at the back of the heel that make slipping in and out of a pair of these as easy as easy can be. With a classic, unisex design making these the perfect casual shoes to wear out and about, these slip-ons were created specifically to withstand the challenges of the outdoors. The rubber sole and rubber uppers ensure the shoes are water-resistant, designed to resist accumulating dirt or muck and easy to clean down when they do. The insulated interior of the shoes keep your feet warm when you’re out gardening in colder months, and cool in the summers, with a convenient pull tab at the heel that lets you slide in and out of the shoes with ease. 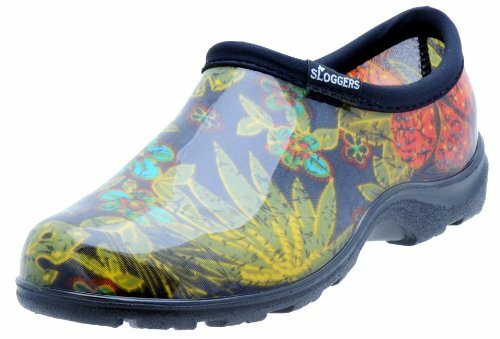 To maximize your comfort whilst wearing these shoes, they also come with a padded, moisture-controlled inner cushioning that cups and hugs your feet to pamper them as you toil through your flowerbeds, and effectively prevents those pesky blisters and sores that making wearing closed shoes otherwise impossible. Gardening can be messy business, and shoes which tear easily or require their own separate maintenance session afterwards can add to the chore. The ideal gardening shoes are sturdy, tough and durable – look out for naturally water-resisting, easy-to-clean options, including clogs and boots made of synthetic rubber or EVA, both favored in footwear intended for messy, spill-prone environments. These materials can generally resist a lot of wear and tear, protecting your feet from insects, thorns, sharp-edged tools or just mud, while still being comfortable to have on for long periods of time. In fact, comfort is another major factor to keep in mind when picking the right gardening shoes. No matter how much time you spend in them, tough, unyielding shoes might leave you with painful blisters, whilst shoes without the proper ergonomics can leave you with aching heels and soles and the likelihood of creating and exacerbating long-term posture problems. Look out for shoes designed with ergonomics in mind which cushion and support the foot, molding to its shape and holding up its natural curves and arches. The right, comfy pair of shoes can go a long way in making your experience gardening all the more enjoyable and fulfilling. Looking for Some New Gardening Tools? Studies have shown that gardening is a great outdoor activity that actually relieves stress and improves brain function. Therefore as an avid gardener or beginner you need the proper tools to help you enjoy this outdoor activity in bliss. You might be wondering which tools-set best suits your gardening needs. Don’t fret, we have you covered. We have put together and analyzed four of the top rated garden tools sets in the market, so as to help you make an informed decision. Vremi’s Garden Tool Set has been described by many as one of the best horticulture garden helpers. It features: a weeder, pruning shears, trowel, rake, trans-planter, cultivator, a pair of cotton gloves, sprayer bottle (25oz/750ml) and an attractive gardening tote bag. All its tools have durable cast-aluminum heads which make them sturdy but not too heavy. They have ergonomic soft finger-grip handles which ensure that your hands don’t easily slip off the handle while working. The handles also have hanging holes at their back ends to help provide clutter-free storage. The tough cotton gardening gloves are light and help protect your hands and keep them clean. The 25oz sprayer bottle allows you to easily water while gardening. The tote bag is attractive and spacious allowing you to fit most of what you need in one place as you move around your garden. You can fit your food containers and several hose sprayers and still have room for more stuff. The bag is sturdy, well-stitched and easy to carry around which means you don’t have to keep going back to your shed to get tools and other items that you may require while gardening. 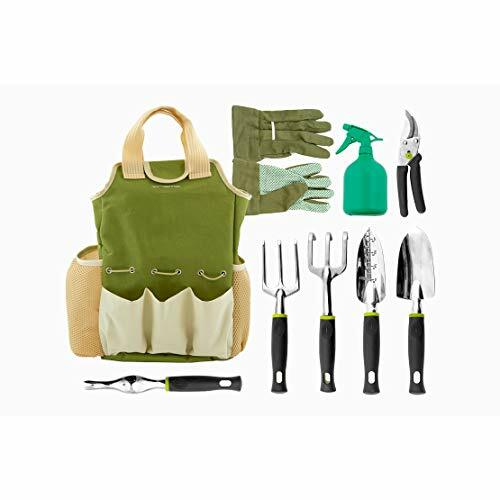 All in all, this tool set is practical and caters to most of your gardening needs; it can be used by both an amateur gardener and a pro. This Premium 3-Piece set is one of the tools-sets in the market that is guaranteed to give you value for your money. It features a garden trowel/garden rake, a hand weeder and a hand cultivator. The garden trowel is ideal for breaking up the earth and for digging small holes for the purposes of seeding or transplanting. The hand weeder facilitates the removal of stubborn and tenacious weeds while the hand cultivator helps loosen and aerate the soil by removing surface weeds. Each tool is ergonomically designed and molded to achieve high performance. They provide you with a natural grip and soft touch that reduces the stress on your wrists and hands. The tools are made from high resistance cast aluminum that is highly durable and doesn’t rust after normal use or storage. The tools are strong and light in weight making your gardening experience enjoyable. The packaging of this set of tools is environmentally friendly and of high quality. To top it all off, Urban Grange Living provides you with a risk-free money-back 30-day satisfaction guarantee and a lifetime warranty as well as top notch customer support. The Premium 3-piece Durable Garden Tools Set is a tools set that will enable you to enjoy your gardening time and you won’t suffer from sore wrists or blisters after a day of gardening. Generally, it is a tools set that maximizes power, performance and comfort at an affordable price. It’s easy to see why it made our list of top rated garden tools. If you are looking for garden tools that are functional, elegantly designed with a sturdy one-piece build, then look no further than the Gardening Tools Set from ROCA Home. 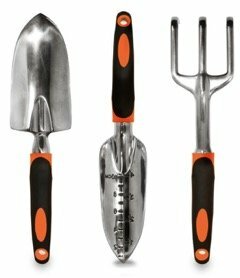 This 3-piece polished stainless steel garden tools set includes: a trowel that is designed to maximize leverage on tough soils, a trans-planter that has depth markings and a cultivator that has sharp prongs to dig into tough soils. This tools-set combines elite design and high quality construction. All the tools have a one-piece design that reduces the risk of breaking. The tools are polished stainless steel hence they don’t rust and are easy to clean. They are light in weight and are fitted with soft rubber on the contours of the handles so as to minimize muscle and joint pain. Worth noting, this tools-set also has two exclusive features. First, it comes with an attractive waterproof bag which serves to hold each tool in perfect place during storage. The bag also enables you to carry the tools around your garden without the risk of losing them. Secondly, the tool set comes with a gardening guide that is filled with tips and tricks as well as a vegetable garden eBook. ROCA Home is so confident that you will like this tools-set that they offer you a money-back guarantee in case you are not satisfied. All things considered, this is one of the most elegantly crafted garden tools set in the market. It can be a perfect gift for an avid gardener that you know. This tools-set from GardenHOME features tools that are well crafted, durable, strong and attractive. 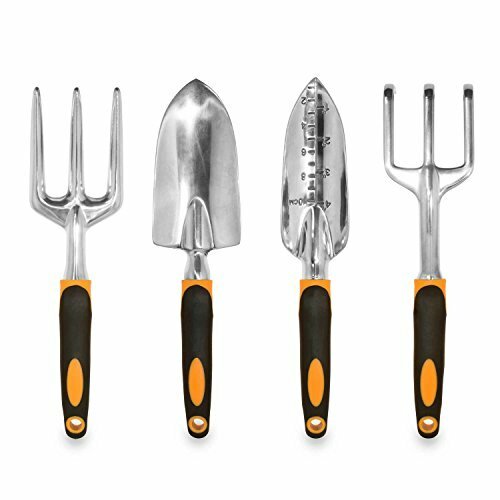 This 4-piece set includes: a trowel, a trans-planter, a cultivator and a fork. It features cast aluminum tools that are easy to clean, resistant to rust and good-looking. The ergonomic frame of the handles ensures that the handle naturally fits your hand, therefore encouraging you to have a neutral wrist position which reduces stress and fatigue during gardening. The holes that are located at the ends of the handles allow for convenient clutter-free storage. This garden tools set will undoubtedly serve you for a long time. GardenHOME are committed to providing brands that are focused on high quality and value for your money. The GardenHOME tools set will help make your digging, cultivating and transplanting activities blister-free and easier. 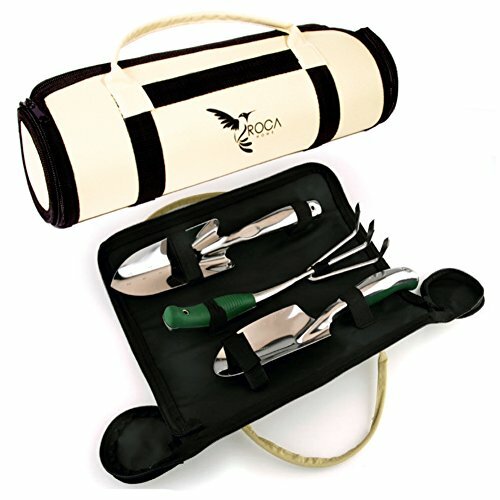 This Gardener tools set can also serve as a good gift for a gardener that you know. We have successfully and comprehensively navigated through the features of four of the top rated garden tools in the market. Whether you choose the Vremi 9-Piece Garden Tools Set or the GardenHOME Ergonomic Garden Tool 4-Piece Set, we hope that this review will have helped inform your decision. Gardening is good for the body and soul, therefore strive to enjoy it with the best available tools-set for your unique gardening needs. Enjoy your gardening! What are the popular types of garden tools? Spade – Probably the most popular tool, a spade is great for digging, edging, lifting sod and cutting. Shovel – A tool that either has a round or square point, shovels are great for digging or tossing dirt. You can apply foot pressure to the top rim to really dig in the soil. A rounded point allows it to easily cut through tough soil or compacted clay. Rake – A rake is basically using the concept of a person’s hand and fingers and scaling it larger. These instruments are great for removing debris or sifting through the soil and working through it. Hoe – This ancient tool is great for weeding or breaking ground. The square head is at a right angle and is excellent for chopping and digging. Edger – Most edgers are designed as a half-moon. Edgers are ideal for cutting an exact line where your lawn is right up against a path or garden. They can make your garden or lawn presentation very clean and exact. Trowel – A precision tool for digging in confined spaces. The smaller blade is great for putting in bedding plants and transplanting. Prunders – Your all purpose cutting tool, a pruner is excellent for trimming trees, shrubs, plants and flowers. The sharp blades allow for easy cutting of stems without crushing plant tissue. Make sure you sharpen the blades every season to ensure they work exactly as you want them to.